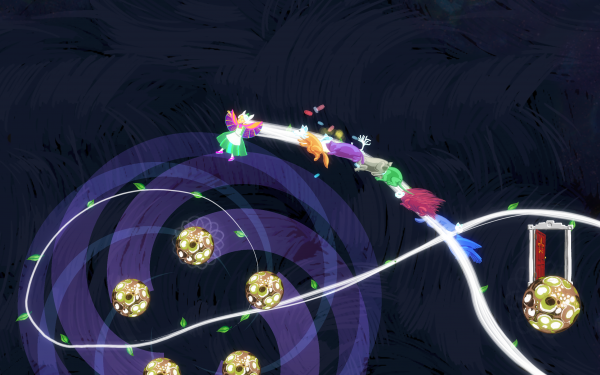 Gravity Ghost is a physics based gravity puzzler with a story, created by a team of indie developers at Ivy Games who between them all have a huge background in developing all sorts of indie titles. The story is one that can tug at the heart once it’s all figured out, but it also has some really cool gravity mechanics, allowing you to slingshot around planets to gain momentum. First thing you notice when you load the game. It’s very pretty. All hand drawn pastel style artwork gives the game a cartoonish look, similar to the likes of Yoshi’s Island on the SNES and Yoshi’s Story for the N64. What this means is that much like those games, the art style will never look old or dated like an old PS1 3d game, looking at you Final Fantasy 7, but instead will always have that cutesy and charming appeal regardless of how old the game is. The game has a lot of talent poured into it from the get go, and it really shows. You have voice acting provided by the likes of Ashly Burch, known for voicing Tiny Tina in Borderlands 2, characters in Persona Q and Attack on Titan, Logan Cunningham, who was the narrator for the stellar award winning Bastion, and Sarah Elmaleh who provided voice over work for Gone Home. All of this talent lends itself to the characters who you meet and interact with, giving everybody you see in cutscenes and the guardians you meet a personality, even if the conversations are usually short. Then all of time playing the game, you have the joy of hearing Ben Prunty providing a wonderful and dynamic soundtrack, who worked on the Faster Than Light games. 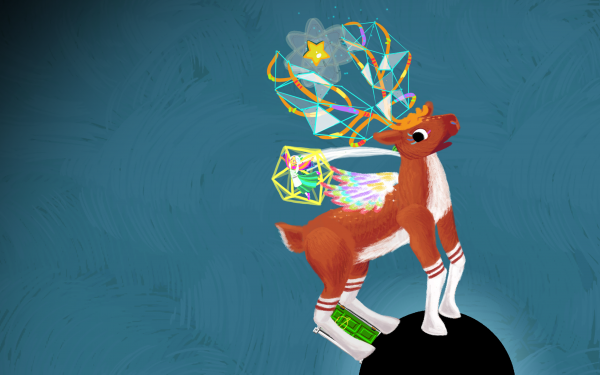 You play as Iona, a girl who floats and jumps around the galaxy. Her job is to reunite spirit woodland creatures with their skeletons, collect stars to open up doors out of levels, and collect flowers to lengthen her magical hair. This hair is used up in order to change planets between various elements you collect during the game, changing earth into ice, and fire to air as explained by Ashly Burch, to herself, as a mouse. You’ll begin by simply jumping up and grabbing stars to leave. But as the game progresses, you’ll learn to slingshot around planets like something out of Kerbal Space Program. Theres around 90 or so levels in all to complete the game, filled with flowers to collect. I began by collecting all of them to keep the length of my magical hair lovely and long, as it’s used up when it comes to converting the planets. But after the first two constellations, it didn’t really matter to collect them as I was never in any urgency to have hair. I imagine it would eventually be a pain if you kept screwing up and kept converting planets, and then having to go back and look for them. The levels themselves can take a couple of seconds or up to five minutes for some difficult levels. Each area you visit gives you an element, but also a new movement option. The first couple gives you things like a drop ability, to become much heavier, and a float ability, so you become lighter. This in combination with all the gravity mechanics allow for nice fluid movement throughout the areas. Speaking of which, the game can be played with keyboard or a controller. The controls do get slightly confusing with a keyboard, but works just fine with a 360 controller. The game is incredibly relaxing. It plays like a polar opposite of something like Super Meat boy, instead of tight, almost perfect controls and repeated deaths, you get loose, free flowing gravity slinging and repeated attempts until you get it right and get out. It does have some flaws though, with the game’s price and length potentially clashing with some people, being a £12 game for a 4 hour-ish experience. However every copy of the game bought on the website does give you a second copy to give out to “someone special” who doesn’t play video games” says the developer, so it’s not that bad when you look at it that way, and it also touches again on the whole idea that the game is very simple to play, so literally anybody can enjoy the game for what it is. However, the artwork, while looking lovely and vibrant in play, does look a little low resolution and rough when it’s zoomed in upon for the games storytelling sections. Still, while the game is short, and sometimes a little rough, it doesn’t stop it being very good at what it does. It’s the anti to most things about AAA modern games, it’s a relaxing, single player experience with a story. And it works wonderfully! 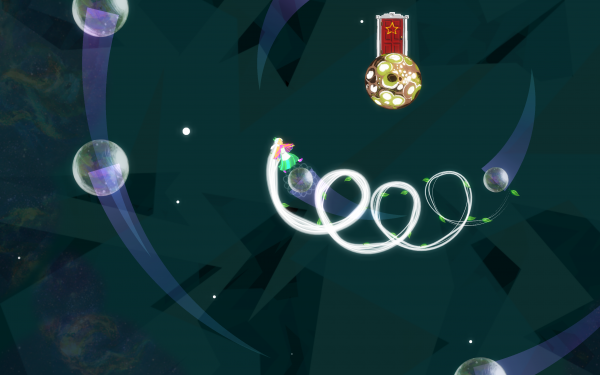 This entry was posted in Uncategorized and tagged Gravity Ghost, Ivy Games, PC, Steam. Bookmark the permalink.